Appalachia Ohio Alliance, a non-profit regional land conservancy serving central and southeastern Ohio, invites the public to an Open House and Dedication celebrating our newest preserves along the Scioto River. 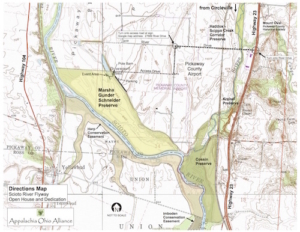 Four properties that comprise a core component of our Scioto River Flyway Corridor Initiative will be featured – Marsha Gunder Schneider Preserve, Kreisel Preserve, Cossin Preserve and the Haddox Scippo Creek Corridor Preserve. Take advantage of this first opportunity to visit and learn more about these spectacular sites. 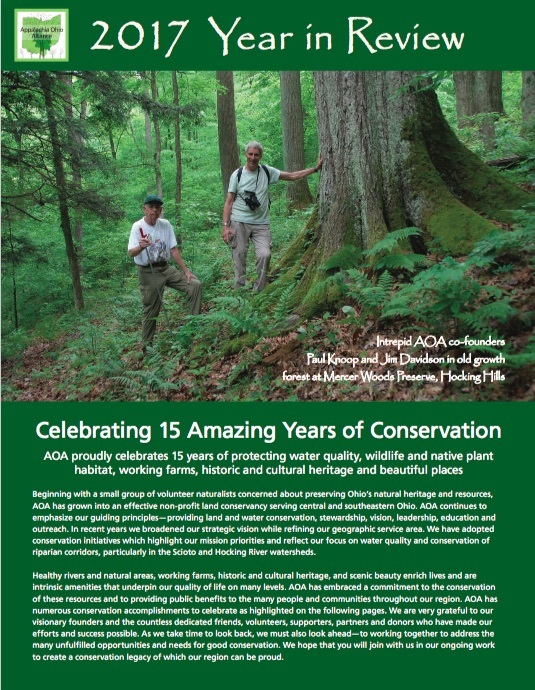 Hear about site history, habitat, restoration plans and community benefits. This “open house” style event features many interesting displays and activities as well as the official dedication of the Scioto River Corridor. Event activities and interpretive displays will be centered in the shady bottomland forest and fields on the beautiful Marsha Gunder Schneider Preserve. Driveway access is located at 27689 River Drive. Feel free to bring comfortable lawn chairs and relax in the summertime shade on the grounds. A highlight of the open house will be captivating interpretive stations manned by representatives of a variety of collaborative organizations who will provide information and insights related to the natural, historical and archaeological features of the property and area. Visitors will be encouraged to interact with presenters and discuss the various characteristics and heritage of the preserve and Pickaway County. Some of the featured interpretive subjects include: glacial-shaped geology and geography, archaeology and native heritage; Floyd Bartley work and legacy; biological significance; habitat conservation; Scioto River Flyway Corridor Initiative; area history; family heritage; and farmland preservation, among others. We are grateful to our partner organizations for helping prepare and present site information, including: Pheasants Forever, Pickaway County Historical Society, Ducks Unlimited, Pickaway County Park Board, ODNR, Pickaway County Archaeological Group, Ohio University Bartley Herbarium, Audubon, Ohio Wildlife Center, National Wild Turkey Federation, the Schneider, Kreisel and Cossin families, and many more. 10:00—INTERPRETIVE DISPLAYS OPEN: Visit the various interpretive stations located on the site and grounds. Stations will remain open until 2:00 pm. 11:55—DEDICATION CELEBRATION: Brief ceremony celebrating the conservation and dedication of the Scioto River Flyway and our partners. 12:15 – VISIT THE SITES: Join one of the site tours and walks or visit the displays. Parking available at the site. Please enter from River Drive and follow the signs and volunteer directions. See online map for more detailed access and site information. Join us and help celebrate these spectacular properties while enjoying our summertime weather in a beautiful outdoor setting. 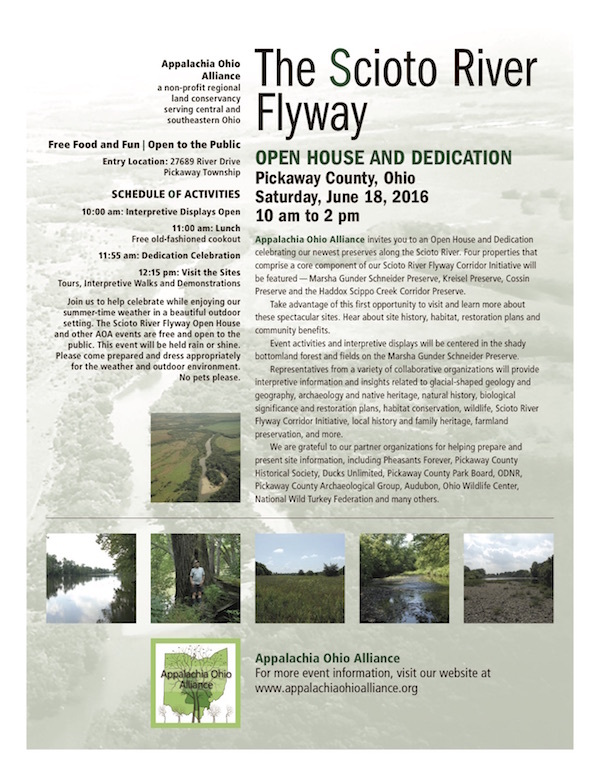 The Scioto River Flyway Corridor Open House and other AOA events are free and open to the public. This event will be held rain or shine – so please come prepared and dress appropriately for the summertime weather. No pets please.